COSEWIC. 2002l. COSEWIC assessment and status report on the western toad Bufo boreas in Canada. Committee on the Status of Endangered Wildlife in Canada. Ottawa. vi + 31 pp. COSEWIC. 2012h. COSEWIC assessment and status report on the Western Toad Anaxyrus boreas in Canada. Committee on the Status of Endangered Wildlife in Canada. Ottawa. xiv + 71 pp. Davis, T.M. 2002. Research Priorities for the Management of the Western Toad, Bufo boreas, in British Columbia. B.C. Minist. Water, Land and Air Prot., Biodiversity Branch, Victoria, BC. Wildl. Working Rep. WR-106. 35pp. British Columbia Ministry of Water, Land and Air Protection. 2002e. Western Toad. B.C. Minist. Water, Land and Air Prot., Biodiv. Branch. 2pp. Campbell, J.B. 1970. Life history of Bufo boreas boreas on the Colorado Front Range. PhD. Diss. Univ. of Colorado, Boulder, CO.
Carey, C. 1993. Hypothesis concerning the causes of the disappearance of boreal toads from the mountains of Colorado. Conserv. Biol. 7:355-362. Cook, F.R. 1977. Records of the boreal toad from the Yukon and northern British Columbia. Can. Field-Nat. 91:185-186. Corn, P.S. 2000. Amphibian declines: review of some current hypotheses. In D.W.Sparling, G. Linder, C.A. Bishop, eds. Ecotoxicology of Amphibians and Reptiles. U.S. Geol. Sur., Midwest Sci. Cent. Columbia MO, 663-696. Davis, T.M. 2000. 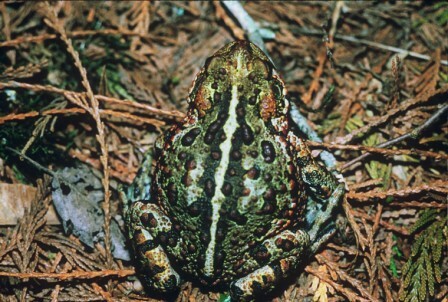 Ecology of the western toad (Bufo boreas) in forested areas on Vancouver Island. Final Rep., For Renewal B.C., Minist. For., Victoria, BC. Govindarajulu et al. 2013. Batrachochytrium dendrobatidis surveillance in British Columbia 2008-2009, Canada. 5pp. Green, D.M., and R.W. Campbell. 1984. The Amphibians of British Columbia. Royal B.C. Mus. Handb. No. 45. 101pp. Gyug, L. 1996. Part IV Amphibians. In Timber harvesting effects on riparian wildlife and vegetation in the Okanagan Highlands of British Columbia. B.C. Environ., Penticton, BC. Hengeveld, P.E. 2000. Presence and distribution of amphibians in the Williston and Dinosaur Reservoir watersheds. Peace/Williston Fish and Wildl. Compensation Program Rep. No. 212. Kiesecker, J.M., D.P. Chivers, and A.R. Blaustein. 1996. The use of chemical cues in predator recognition by western toad tadpoles. Anim. Behav. 52:1237-1245. Leonard, W., H. Brown, L. Jones, K. McAllister, and R. Storm. 1993. Amphibians of Washington and Oregon. Seattle Audubon Soc., The Trailside Ser., Seattle, WA. 168pp. Livo, L.J. 1999. Predator communities and boreal toad breeding sites. In M.S. Jones, ed. Colorado Div. Wildl. Boreal Toad Res. Prog. Rep. 1998. Fort Collins, CO.
Olson, D H. 1992. Ecological susceptibility of amphibians to population declines. In Proc. of the Symp. on Biodiversity of Northwestern California, October 28-30, Santa Rosa, CA. Olson, D.H. 1988. The ecological and behavioral dynamics of breeding in three sympatric anuran amphibians. PhD. Diss., Oregon State Univ., Corvallis, OR. Poll, O.M., M.M. Porter, G.L. Holroyd, R.M. Wershler, and L.W. Gyug. 1984. Ecological land classification of Kootenay National Park, B.C. Volume II. Wildlife Resource. Can. Wildl. Serv., Edmonton, AB. Porter, K.R. 1972. Herpetology. W.B. Sanders Co. Philadelphia, PA.
Slough, B.G. 2004. Western Toad inventory in the Chilkoot Trail National Historic Site, July-August 2004. Parks Can. Species at Risk Inventory Fund Proj. SARINV04-30. Rep. to Parks Can. Yukon Field Unit, Haines Junction, YT. 54pp. Stebbins, R.C. 1951. Amphibians of Western North America. University of California Press. Berkeley, CA. Wind, E., and L. Dupuis. 2002. Status of the Western toad Bufo boreas in Canada. Rep. for the Comm. on the Status of Endangered Wildl. in Can. (COSEWIC), Can. Wildl. Serv., Environ. Can., Ottawa. Cross-Linked Information Resources (CLIR): an umbrella search web application that allows users to use a single window to simultaneously search six provincial environmental and natural resource information e-libraries and provides access to digital documents in these e-libraries.